Danielle has extensive experience in public relations and social media. As a student at Arizona State University, she managed social media and public relations efforts for many student organizations and university initiatives. Additionally, she has worked in communications for nonprofit organizations and political campaigns. 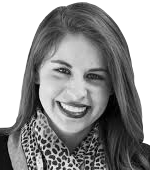 In 2013, Danielle received the Inaugural Cronkite Aspire Award sponsored by Allison+Partners co-founder Scott Pansky, which included a mentorship with public relations scholar Dr. Glen Broom.